Dignity Village, Inc. provides a safe, drug and alcohol free, alternative to the streets for 60 homeless adults every night. In addition to private temporary dwellings, the Village provides basic services including toilets, showers, cooking facilities, telephone, mail, computer access, and access to health care. Dignity Village is an unprecedented and successful effort by individuals experiencing homelessness to create and govern a community in which they can support each other in the transition off the streets and into permanent housing. The following proposal reflects Dignity Village's continuing commitment to provide services to homeless people, but to do so in a much-improved ecologically sustainable physical environment and in increased cooperation with other homeless services organizations. Dignity Village proposes to enter into a long-term lease with the City of Portland for its current site. As consideration for this tenancy, Dignity Village will provide to the City of Portland and its residents a variety of services that meet the needs of Portland's homeless community with little or no expenditure of public funds. To better provide these services, the Village will substantially upgrade the dwelling structures and other facilities on the site, using low-cost but architecturally and ecologically sound development techniques. All upgraded structures will be portable to minimize the Village's impact on the site and to allow Dignity Village to relocate the structures with minimal disruption to its services once a permanent site is obtained. 1) Transitional Dwellings: Private temporary dwellings for 60 adults experiencing homelessness, and, in the future, overflow bunk space for 12-16 additional individuals. Dwellings at Dignity Village are currently make-shift structures, but the Village will replace these structures with structurally and ecologically sound, low-cost dwellings (e.g. straw bale houses) that are built to be transported from the current site if necessary. The attached development plan describes the proposed dwellings in detail. 2) Safety: The personal safety of residents and visitors alike is one of Dignity Village's highest priorities. Each Village resident must adhere to a code of conduct established in the Membership Agreement. The Agreement contains express provisions prohibiting violent acts within and around the Village and makes the commission of such acts grounds for removal from the Village. Dignity Village provides a volunteer security team that controls access to the Village and practices community policing as a means to help resolve disputes that arise. The Village also maintains a good working relationship with the police. The Village has developed and will immediately implement a comprehensive fire safety plan (see below); compliance with that plan will be a condition of residence. 4) Basic Services for Non-Residents: Dignity Village will serve as a day use facility for individuals in the community needing access to a shower, a bathroom, or other basic services. Non-members may also use Dignity Village to access services such as health care, housing placement assistance, and public benefits offered in partnership with other organizations (see below). *	Job Training and Income Opportunities, e.g., through job lines, online job banks, on-site micro-businesses, employer networks and training in ecologically sound construction techniques. *	Continuing Education, e.g., through GED and other classes conducted in partnership with local educational institutions. *	Housing Placement Assistance, e.g., through a cooperative agreement with JOIN: Connecting the Street to a Home. *	Public Benefits, e.g., through maintenance of a program information and application library, benefit and housing program updates at Village meetings, and cooperative relationships with legal assistance programs. *	Regularly hosting school, religious, neighborhood, and other groups, as well as individual visitors and the press. *	Taking part in neighborhood association meetings, public forums, and classes on poverty, homelessness, and ecological sustainability. *	Participating in the City of Portland's planning process to end homelessness. *	Participating in City of Portland events related to sustainable development. *	Sharing through video, print, and other media the story of Dignity Village. neighborhood issues, publicize the identity of that person, and make the contact accessible to neighbors and the Portland Police Bureau. *	Approach and encourage neighbors to discuss and enter into "good neighbor agreements" with the Village. *	Actively participate in neighborhood and community policing forums concerning the Village. *	Enforce the provisions of the Village's Membership Agreement precluding violence and possession of alcohol and illegal substances within a two-block radius around Village. 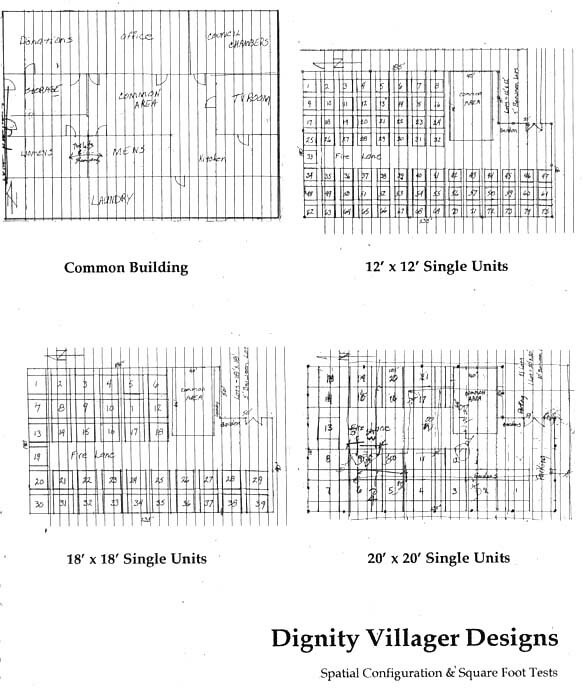 8) Sustainable Development: Dignity Village will develop its site according to principles of environmental sustainability and pedestrian livability (see full development plan below). *	Maintain its 501(c)(3) status. maintenance of transitional dwellings and common spaces. *	Require each resident to contribute to the Village according to ability. providers of services to the homeless community. *	Maintain an active fundraising campaign, including grants, solicitation of individual donors, and micro-enterprises. *	Maintain current efforts to locate a larger piece of property on which to fully realize Dignity Village's long-term vision. efforts, Dignity Village will provide to the City of Portland's Bureau of Housing and Community Development a monthly report of individuals served by the Village (see Exhibit A). This report will include key and documentation of successful transitions from Dignity Village. Transitional Housing Campground, as defined in ORS 446.265. All new development within Dignity Village will be designed to meet the health, safety, and building standards for such facilities, as applicable. 12) Utilities: Dignity Village will cover all expenses related to telephones, trash/recycling, port-o-lets, and online access. 1) A Long-Term Lease: Dignity Village desires a 10 year lease term with a six month termination provision in favor of the Village. The latter is necessary to allow the Village to continue to pursue a larger parcel on which to build permanent facilities. * Relocate the east boundary fence adjacent to the sidewalk on Sunderland Rd. * Remove sufficient blacktop to permit rainwater flow to the existing drain in the northwest corner of the site. * Install an emergency exit in the northern corner of the east-facing boundary fence. * Create a place making graphic in the central plaza of the Village. sewer line running adjacent to the site. Dignity Village would also ask that the City of Portland continue to incur the costs of water and electricity for the site. 4) Land Use: Assistance with incorporating the provisions of ORS 446.265 into the City of Portland land use code and the designation of the Sunderland Yard parcel as a Transitional Housing Campground, pursuant to the provisions of that statute. Dignity Village is the only place-based community in this town that practices grass roots democracy with an ecological vision. It is the only walkable community not invaded by cars, and it is the most cost efficient self-help model for transcending homelessness in the nation. "What are the benefits of urbanity?" is a question that asks to hear the story of the rise of cities, and the fall of village environments where all cultural forms first took root and began to grow. Indeed, the best that is within human nature has been confirmed by the basic, cultural structures we now enjoy every day. Decision making, design, construction, economics, science, and social patterns were all established within the village where we first came together, and they persist with us to this day. In spite of an intense competitive emphasis in our society, all that makes it work remains about creating and cooperating according to agreements. However, in the context of the city where democracy, society, ecology and economy are supposed to add up to urbanity, our fabric of place has too often been unmade by too hasty sweeps of politics and power, resulting in just too much human pain and waste. Dignity Village proposes that problems and opportunities are the reverse side of each other. Of course Dignity is a self-help model, because all solutions to all problems reside in participation and engagement in community with each other. Dignity is a village model, integrating all functions of daily life at a local scale, because when numerous challenges are brought together they can be met together. Dignity is not merely a place to abate violence long enough for a person to gain their feet, it is literally a place where a person can learn more about what it means to be a participant, engaged in a big picture that includes them. They get to "be somebody". Yes Dignity is walkable, and will have many porches, but the livability of the environment already has exceeded such benchmarks on the way toward something more: A cultural place of self-stabilizing and self-regulating patterns. As to safety concerns, Dignity has been an immediate improvement for all residents after having slept in doorways or under bridges. For women at the village, there has been such an improvement from street life that the difference has been total, between fear and no fear. 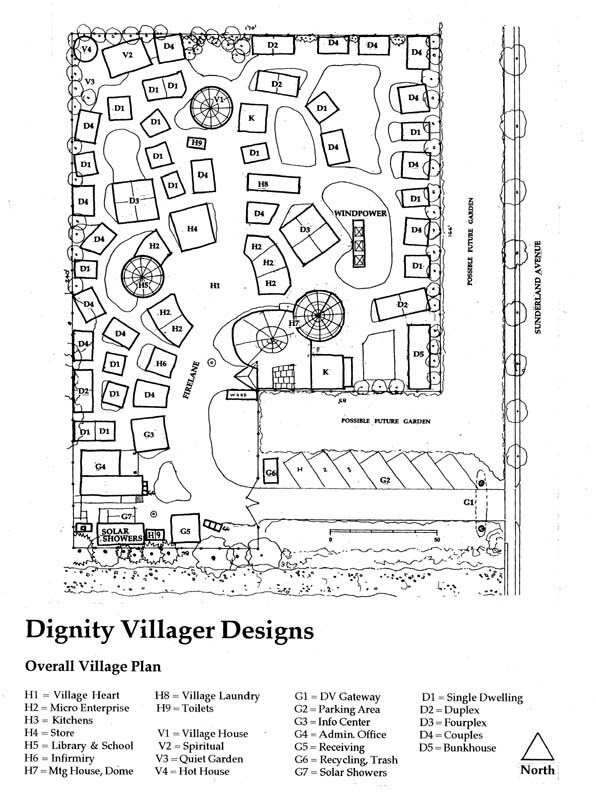 Since the initial vision of Dignity Village was first codified as a document for consideration, the Village has proceeded to accomplish, in part, nearly all of its foundational and transitional goals. They have managed to stabilize, organize themselves, and build success upon success as a compliment to the city as a whole, especially in providing a place for homeless people to go who have so few choices. So, in this next cycle of the development of Dignity Village, its inhabitants will become even better at working together. They will improve all dimensions of the village administration and maintenance. Space usage will become more safe and efficient. The villagers will also become more effective at helping people transition through and return to life in the city. There will be a difference though. Each person who leaves the village will be stronger and able to contribute more to their society and the families they will reclaim and build. "Just as poorly designed urban environments are associated with social disorders such as crime, alienation, violence, and drug abuse, so carefully designed places can uplift and improve the health and well being of individuals and communities." Dignity Village will be a unique and inspirational model of place making. Unlike the infrastructure of most streetscapes typically found in cities across our country, Dignity will use powerful urban design concepts in order to inspire and uplift the people who will live there. As already stated, the self-generated vision of the village will also contribute to broad societal dialogues on urbanity, democracy, social and ecological sustainability, and homelessness. This integrative model will be supported, literally, on a geography of connection directly rooted in our ancestral, American vision of participation as the civic spark of freedom. Will this heal and help people so neglected and hurt by their world as to have become marginal and "disposable"? We shall see. 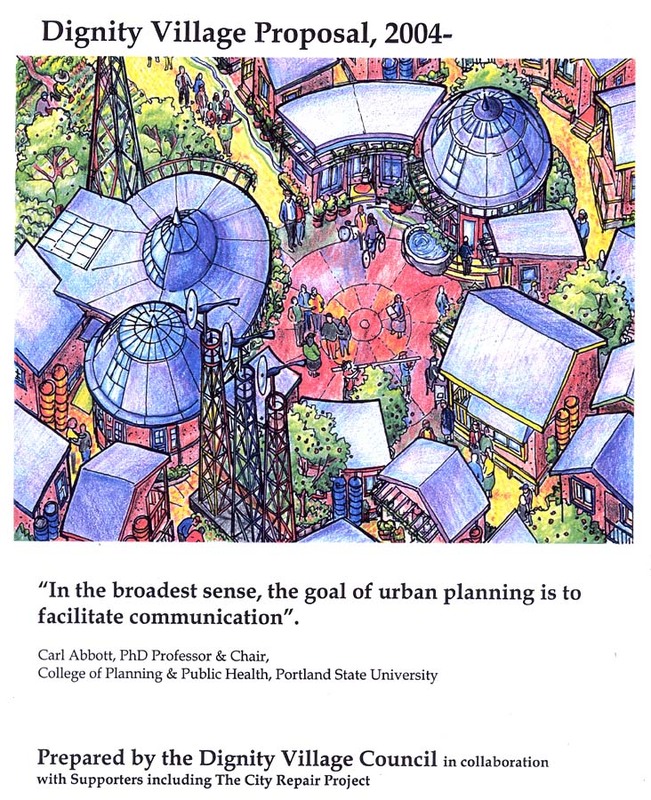 An Urban Heart, or village center which accommodates the constant life and occasional event. This important location, along with the fire lane, will feature a latex-painted place graphic. Gateways which mark openings, passages, and transitions into, out of, and within the village. Active Nodes for Communication at every possible geographic intersection, enabling crossroads to work as connection points where "lives converge". These locations will also feature latex-painted surface graphics. A Weave of Paths supporting a network of intersections as place-nodes, with primary, secondary, and tertiary routes. Paths will be delineated with latex-painted graphics. Memorials and Cultural Features, such as artwork created by villagers, which establishes a strong sense of local identity that is reflective and supportive of village inhabitants. A Overall Form which determines a sense of boundary that makes the village both defined and aesthetic. Because these basic principals of place making have not yet been applied to even the common neighborhood environment, we can know that community development cannot fully develop in these "normal" circumstances. This makes Dignity Village exciting, because a place where these ideas can serve to uplift the less fortunate can also serve to inspire the rest of us. Fire and life safety systems will be integral to the design and construction of the village. Some of these are already partially in place, such as fire lanes, setbacks, fire equipment, rain barrels, egress doors and windows. * Setbacks and Pathways- a minimum of five feet will be maintained as a setback and right of way between structures for safety and village access. * Fire Stations - 5 throughout the village, equipped with ABC fire extinguishers and axes. * Smoke Detectors - installed in common buildings and each individual dwelling, per code. * A trained villager will be designated as a resident Fire Marshall. * Rain Barrels for fire suppression installed at each common building and dwelling. * Stove and heater fuel shall be installed within 1 hr. fire rated cabinets, outside living spaces. * Each common building and dwelling unit to have fire egress windows and doors per code. * Non-flammable roofing requirement for all village buildings. * Map of the village will be provided for fire department reference. * Discourage rodent population with raised platform structures. In keeping with the ecological vision of Dignity Village, there will be a strong emphasis on reducing energy consumption, efficiency, and the use of passive and active solar strategies along with wind power. All fixtures will be recycled and/or energy efficient. * Option A - All common and personal systems will use renewable solar and wind energy. There will initially be individual solutions, and later more central systems. Power may or may not be fed back to the grid. * Option B - Tie directly into grid, depending upon efficiency and reduction as a strategy. Various kinds of cooking fuel will continue to be used in common kitchen areas and dwelling spaces. Fuel sources will be housed in fire rated enclosures per code. The village will implement water catchment systems on all structures to control run- off and pooling on the asphalt. The resulting water volume will be stored in rain barrels (former 55 gallon vegetable oil drums) that will be used for fire suppression and watering gardens. With adequate filtration (Carbon, UV and flow forms) the harvested water can be used for showering, toilets and possibly consumption. Excess run-off will be directed to a villager-created above grade stream constructed from bermed sand and pond liner, to act as an aqueduct which will conduct water to the drain at the NW corner of the Village. It may also be diverted to storage cisterns or a created pond. Water collected for permitted human use, such as showers, will be preheated with passive solar collectors and then boosted by a centralized on-demand water heater powered by propane. Water from sinks and shower areas will potentially be diverted to grey water gardens, with system design worked out with the Office of Sustainable Development and the Bureau of Environmental Services. A: Partial port-o-let use will be combined with UL permitted composting toilets as they can be acquired. In cooperation with the city, we would like to advance this technology as a safe and efficient method of disposing of human wastes. Composting toilets provide a waterless and free-of-ongoing-cost solution to human waste, in addition to creating compost for ornamental crops. There will be two human waste stations located in the village. B: Connect to city sewer as primary system and compliment with ecological options. Each animal owner must provide shelter, food, and waste removal for their pets. Animal waste will either be composted per an appropriate system or disposed of in accordance with the agreed upon method for human wastes. There will be appropriately located litter boxes for cats and bags for dog waste clean up. All appropriate organic material will be composted for use in gardens. Forms of composting will include general organic composting and vermiculture (worm composting). Compost bins will be located next to major planting areas. Recycling bins for all materials will be distributed at near the gate & administration area for ease of pickup by haulers. Public transit will continue to be the primary mode for most villagers, and some will also have their own vehicles. Automobile access within the Village will be limited to occasional loading and unloading. The village may elect to obtain a van in order to provide a shuttle service for common use, field trips, and for villagers with limited mobility. Owners of private vehicles will be responsible for their own maintenance and removal of any non-functional vehicle. The village will implement a policy of " If it doesnt run, it doesnt stay". All abandoned and derelict cars will be removed or donated to other organizations as appropriate. The village will also provide secure bicycle parking areas. Those intersections which are not hard-surfaced gathering areas or path crossings will likely include plantings, gardens, or trellises. Several of these nodes will be developed as green commons, located within accessible raised beds. They will feature grass walking surfaces, with amenities for sitting and recreation, effectively acting as park spaces for village use. Rooftop gardens for strawberries and other possible crops. homeless people. Depending on production capacity, some will be produced for market. Storage of vegetables will occur in an above ground strawbale root cellar. Trellis structures will be incorporated into the passive solar design of individual structures, and as a shade network strategy along pathways and on the edges of open squares and green commons. These will provide structures on which kiwi, grape, and other food producing vines can grow, and will also provide shade for both village inhabitants and shade tolerant crops. Moveable forests of bamboo and some tree varieties in contained pots and beds will be placed on the perimeters of the village as shelter belts from the winds, and also as sound proofing. These shelterbelts of bamboo will also help with air quality control with the gases from the adjacent composting yard. They also provide a fast-growing harvestable crop for construction purposes. All buildings at Dignity Village will be built to last, and to meet safety and structural requirements. They will serve functions as varied as teaching and learning, cooking and communal dining, small and large scale gatherings for community processes, and as shelter for short and long term use. All structures will be permanent in the sense that they are built to last a long time against the weather and that they are beautiful to see. However, all buildings will be moveable, in the eventuality that the village finds another, more permanent location. This means that all structures will meet structural and seismic design requirements, but that their short post-foundations can be disassembled. The larger structures will also be modular, so that they can be taken apart and lift on to flatbed trucks. Most of the structures will be light enough for 15 - 20 villagers to lift. The village will continue to build with an ecological action plan, using community processes, passive and active design strategies, and recycled and natural materials as much as possible. The normal population of Dignity Village will remain at sixty people. The transitional population, who are working to stabilize and return to normal housing conditions will comprise two thirds of the normal population of sixty five residents. The village will also accommodate as many as sixteen additional transitional residents during the winter season. The permanent and semi permanent core of villagers, whose work coordinates, guides, and maintains the village, will consist of one third of the normal population of sixty. All residents will work from design to construction on their own dwellings, assisted by a village construction crew and leader. 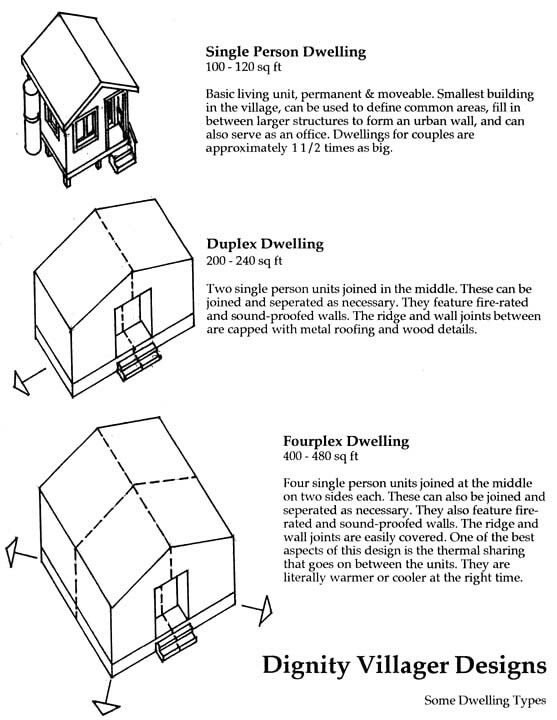 See Dwelling Types for information on dwellings. The common use buildings of the village will also depend upon villager participation for design, construction, programming, and maintenance. All structures in Dignity Village will be built in accordance with applicable safety and structural standards. In addition the VBG (Village Building Guide) will be incorporated into the process of design and construction of structures at Dignity Village. The foremost guideline of the VBG is that all village construction demonstrates safety, affordability, energy efficiency, and community identity. This also means that they will be beautiful. 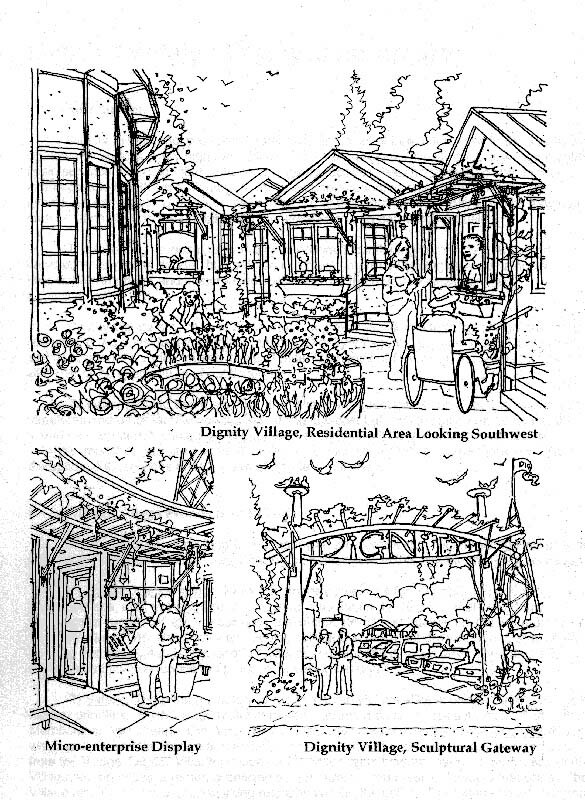 The Village Building Guide states: Dignity embraces innovative and varied solutions to the problem of shelter. We will accommodate diverse needs, allow for individual expressions, and we will honor the integrity of what efforts have already been made. A - All structures will be safe, affordable, energy efficient, and will reflect community identity. B - Architectural solutions will ensure outward public expression and inner privacy. C - Structures will be built according to size and placement requirements of the village plan. D - All buildings will be passive solar in design and allow for solar access of adjacent buildings. F - All dwellings have at least one door egress and several window escape routes, per code. G - All buildings have operable windows for ventilation. H - All roofs use rainwater catchment systems. I - All structures strive toward maximum sound proofing. J - All inhabitants are involved in construction and maintenance of dwellings. K - All structures follow loose village theme with ample room for individual expression. L - All buildings aim towards space efficiency. M - Buildings follow banned materials list: No tarps, flammable, or dangerous materials. N - All buildings will be modest in scale, modular, and built with recyclablity in mind. O - Minimum foundation platform height is 18"; platforms to use planking, not plywood. The one third semi-permanent and permanent core, and the two thirds transitional population will occupy an assortment of dwelling types and configurations, with no distinguishing preference in core villager dwellings. Square foot limits can vary depending on special circumstances and accessibility requirements. D1 - 33 Single person dwellings will occupy 98 - 120 square feet each. D2 - Some of the D1 dwellings will be clustered in duplexes, with required fire separation. D3 - Some of the D1 dwellings will be clustered in fourplexes, with required fire separation. D4 - 16 double occupancy dwellings will occupy 150 - 180 square feet each. D5 - Village Bunk House to house 12 - 16 transitional residents. Typical structures will be conventionally framed and then in-filled with light straw clay insulation. The walls will then be coated with an earthen masonry plaster of up to one inch thickness, providing rodent proofing, fire proofing and thermal mass. Light straw clay is a European building technique that uses high insulating benefits combined with the dual binding and fire preventing properties of clay, creating a natural and low tech insulation solution to framed structures. Light straw clay offers non-toxic insulation and sound barrier properties to conventionally framed structures. It has an R- value of 2+ per inch and is both affordable and energy efficient. Its non-technical, non toxic nature lends itself to community design and construction, both empowering the villagers and training them in valuable construction skills. heat the internal thermal mass. There are already numerous building types in Dignity Village, most of which serve multiple functions. As the village develops it will establish structures that are more specifically designed to accommodate certain uses. Because a village consists of numerous, different dimensions, these will need to be housed in several new, modest buildings. Please see the list below, and refer to the village plan to locate where they will be placed. H1: The Heart of Dignity Village will be the piazza of the community commons, a large open area in the middle of the village serving many functions. As the main artery of the village it accommodates the fire lane, the business area, library/school, infirmary, and micro-enterprise ateliers. Also adjacent to the community meeting house and council chambers, this space will accommodate informal daily activities and scheduled activities such as performances, celebrations, public speaking and other important events. This central area will create a membrane between the public and the private space of the villagers. 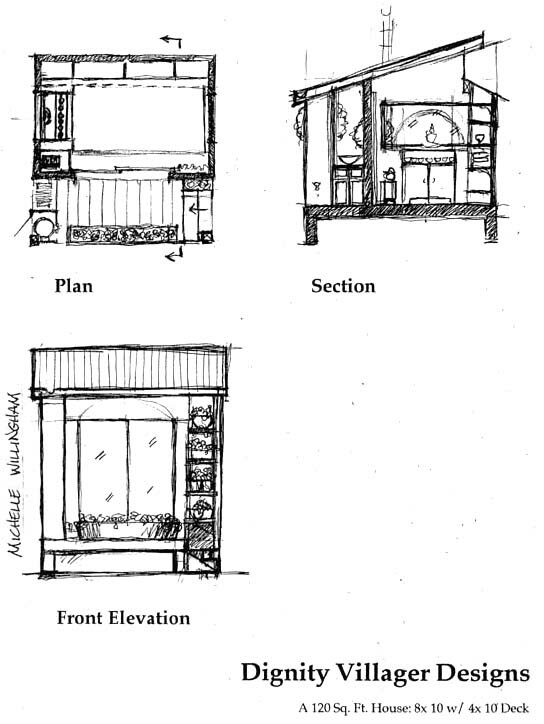 H2: Micro-Enterprises will accommodate work areas and will feature display counters and windows. Small separate structures, all together these will comprise the enclosing walls which define the piazza space. H3: Two certified communal kitchens will be built. The two kitchens will be located in different areas of the village, and one will be larger with the capacity to serve existing villagers and also to prepare food for guests and volunteers. H4: The Store will distribute all supplies and materials acquired by and donated to the village. Items will be sorted, organized and displayed for villager use. These items will be part of the local village economy of sharing with a means of exchange yet to be determined. H5: A Library and School will define the western edge of the piazza. This structure will provide facilities and resources for learning, teaching, and skill sharing. H6: The Infirmary will be located between the main gate and the piazza, in order that mobile medical units be able to provide services to the village without needing to enter the center of the village. This will minimize disruption of daily life in the village while facilitating access by the medical personnel. This space will be designed and built in coordination with NW Medical Teams. H7: The Community Meeting House and Council Dome structure will be upgraded, with new safety systems, material repairs and new floor surfaces. H8: The Village Laundry Facility will use rainwater collected on site for washing clothes and passive solar heat and ventilation for drying. H9: A Second Set of Toilets will be added to the north end of the village heart. G1: The Dignity Village Gateway will present the identity to the larger city. With an appropriately designed and crafted sign this structure will introduce residents and visitors to the sustainable vision of Dignity Village. G2: The Parking Area will feature three spaces reserved for visitors, including one ADA space. Remaining spaces will only be available to registered, operable vehicles. G3: The Information Center will be a receiving facility for visitors and guests, with exhibits on the Dignity Village sustainable vision, history of the village, with informational documents available. There will also be a resource directory for additional information and services regarding issues homelessness, poverty, social justice, ecological and cultural sustainability. G4: The Administrative Offices will continue to be housed in the onsite trailer that will be upgraded. Additional space will be added to the north of the trailer, housing the shared office of the council president, secretary, and the treasurer. G5: The Receiving Tent will temporarily accommodate incoming donations to be organized and moved to the Village Store. G6: Recycling, Trash, Compost, Toilets and Sanitation will be clustered between the parking area and the offices for ease of access by truck operators. G7: Solar Showers will replace the existing shower system. The existing shower house will be upgraded with new solar thermal heating system. V1: The Village House will be a place where villagers can gather with personal items decorating the space, where visitors will not have access. V2: The Village Spiritual House will be a non-denominational sacred place for gathering, communion and sharing. V3: The Quiet Garden will adjoin the spiritual house, providing an open space for reflection, meditation and enjoyment of beauty and peace. V4: The Village Hot House will be a space for use by villagers who, in their process of recovery, are cleansing and detoxifying as they strengthen and prepare to reenter the society of the city. D1: Single Dwellings will each provide sleeping, study, storage and comfort needs, with the space efficiency and flexibility to accommodate more than one person if necessary. D2: Duplex Dwellings will provide the same amenities as Single Occupancies, with two joined into one structure. D3: Fourplex Dwellings will provided the same amenities as Single Occupancies with four joined into one structure. D4: Couples Dwellings will provided the same amenities as Single Occupancies, with one and one half the amount of square footage. D5: The Village Bunk House will provide minimal sleeping and storage accommodations for use during the winter season as the village population swells. D6: Individual Animal Houses will be placed according to need. The village is ready for its fourth winter. The first priority, as always, will be to see that everyone is dry and as warm as possible. Roofs will be made ready for winds and rain, and other preparations will ensure that residents are secure and safe. To date, the village has been able to build with what skills and energy the villagers have available, and with the help has stepped forward with donations of time and materials. The schedule we propose will necessitate more resources and consistent oversight and coordination, which will most likely exceed the capabilities of the present village population. In order to move the schedule at the most desirable pace, we will be seeking funding for a coordinator who can work to oversee and assist progress on the schedule. A - Make every dwelling ready for winter winds, rain, and cold. 1 - Complete work towards the Village Safety Infrastructure, including fire stations. 3  Update and improve existing common buildings and areas. as common kitchen, and a second set of toilets at the north end of the village. 5 - Upgrade waste, recycling, and compost systems. 7  Incrementally complete remaining common buildings and infrastructure. 8  Update and augment administration buildings. 9 - New energy systems will be coordinated and installed for the whole village. 10 - The village Heart, with micro enterprise ateliers and other effects. 11 - Gardens, commons, and other planting areas will be completed. This is the proposed budget for the renovation of Dignity Village. Previously, Dignity Village has been supporting its construction through generous donations and an extensive volunteer labor base. The following options represent three approaches to improving the safety and quality of living at DV. As applies to all options, the major reconstruction of DV will commence in May 2004 with DV participation in the Village Building Convergence. The Villages participation in the VBC will be a catalyst toward the education process of the Dignity Village builder team that will follow through with the construction effort over the course of the summer of 2004 and into the future until the moveable/permanent village is complete. Funding for materials only. All projects to be completed by volunteer labor provided by Dignity Villagers and other active supporters. This option reflects the present process. Funding for materials in addition to a paid DV construction team consisting of four Villagers billed at $10/hr each. The construction crew would be trained at no cost during the 10 day Village Building Convergence and continue applying skills learned after the event at the rate of $10/hr. There will be design and technical consultants from City Repair after the Village Building Convergence to volunteer their assistance at the request of the Village. Funding for materials and a paid Dignity Village construction team (as in Option B) in addition to an on site Village Construction Coordinator. The Village Construction Coordinator, as a non-Dignity Village member, will be a salaried manager of the overall project. This individual will receive a $25,000/year salary. After VBC training, the construction crew will be able to complete the simple modular design of the single dwelling unit in approximately four days*. A construction crew of three trained Villagers and one experienced leader all paid $10/hr working 8 hours for four days will complete the framing and strawclay infill of each single dwelling unit. The total labor costs for each unit will be $1280.